For the serious prepper, one of the most common food preps within the category of ‘dry goods’ is wheat (wheat berries). The essential ingredient for making your own bread from scratch. The thing is — you can’t make bread if you can’t mill the wheat to flour. When choosing a flour mill, check the reviews – be sure that the mill will grind the wheat berries into ‘fine’ flour. Apparently many cheaper models don’t, although claiming that they do. If you intend to use the flour mill often, you will need to adhere to the phrase “you get what you pay for”. Quality comes with a price. 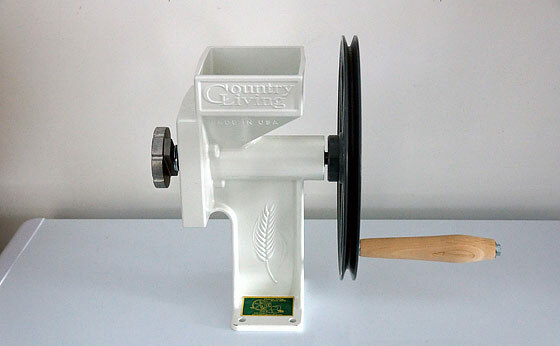 The ‘Country Living Hand Grain Mill’ is one of the best, and it’s actually ‘Made in the USA’. I like the fact that it has a pulley so you can adapt another method of turning it other than ‘elbow grease’. It is expensive. But it will survive Armageddon 😉 and if Armageddon doesn’t happen it will survive many generations. The ‘Wonder Junior Deluxe Hand Grain Flour Mill’ is likely the ‘next best’ in quality and I believe it is the most popular flour mill in the hand-mill category for the serious prepper – although still pricey. The ‘VICTORIO Hand Operated Grain Mill’ is a decent entry level mill, and is very popular due to its price point. I don’t have this one, but I suspect that over time and hard use that it ‘may’ devolve. Read the reviews though… it may be okay for you. We have used the NutriMill for years – and it has held up to quite a substantial amount of milling and bread-making so far. I have 2 grain mills, one for flour and one for chicken feed. The Estrella (red one)from Amazon at $45, does a great chicken feed grind. My Grainmaker, from their .com, is the best hand flour mill ever! It’s all steel, american made in Montana, can be hand, bicycle, or motor driven. Not cheap, but at TEOTWAWKI do you want cheap? Or would you maybe like to do a little grinding for barter? Will grind popcorn, wheat, peanuts, whatever you give it. Love this mill! I would have to agree the GrainMaker® Grain Mill Model No.116 is a heck of a hunk of equipment, A friend has one, and I’m saving some cash for one, $1200. I also have a Kitchenaid Mill, it works great, till the power goes pooooffffff. I have the model #99. Its up to $675 now. I didn’t even consider the “expensive” one! HaHa Really, the one I have is a tank and does every think I could ask in one pass. It does the job and I would recommend it to anyone. We used a kitchen Aid mill for many years – the model we had was cast aluminum, of very high quality and very easy to set the grind. If any one wants a quick entry into the wheat milling world, this is a great electric option if you have a Kitchen Aid. Does the Kitchen Aid grind the flour fine? I’ve read some reviews that says it grinds a coarse flour but not a fine flour. Yes you can grind the flour quite fine, i run it twice, first to crack it about 75% than to the consistency I want. We have a Country Living mill — looks like the one in the photo above. It’s a fantastic piece of equipment! Ours is mounted on the island in the kitchen area so it is very easy to grind berries at a moment’s notice. I made a sack to catch the flour and also made a cover for the chute at the top so that dust going in from above would be at a minimum. My basic wheat roll recipe is below and I came up with it many years ago. The rolls are ever so slightly sweet and wonderfully rich — delicious for every day and fantastic for a meal when company comes. Depending upon the shape during the second rise, the rolls can become pan rolls, dinner rolls, crescents, or cloverleafs. With a crease and a fold-over, the dough can be shaped for Parkerhouse Rolls, too. I even use this recipe as the basic bread to make Cinnamon Rolls. I’ll post that below, too. Scald milk in saucepan and remove from heat. In the same saucepan, add shortening (or coconut oil), sugar, and salt. Stir to allow ingredients to blend with the scalded milk. Stir until shortening melts and the sugar dissolves then cool to lukewarm. Meanwhile, sprinkle yeast into a measuring cup with 1/2 cup lukewarm water and stir to dissolve the yeast. Set aside. When scalded milk mixture has cooled, transfer to a mixing bowl. Add 1 1/2 cups of unbleached flour to the milk mixture (reserve 1/2 cup of unbleached flour for final mixing). Mix for 1 minute; beat in the 2 eggs, then add the yeast and water to blend. Gradually add the 2 cups of whole wheat flour and the whole wheat gluten flour while mixing to make a soft dough. If the dough is not leaving the sides of the bowl, slowly add additional unbleached flour (use the reserved 1/2 cup of unbleached flour). Turn dough onto lightly floured surface and knead until smooth and no longer sticky (or machine knead) for about 8 minutes. Place kneaded dough in lightly greased bowl, then invert to place dough greased side up. Cover and allow to rise in warm place until doubled (1 hour or more). Punch down and turn out onto lightly floured surface. To make rolls, divide dough into roll portions ( I usually weigh my roll portions at 20-22 grams each). Shape each portion as desired. For pan rolls, shape the dough in 2-inch balls. Place in greased round layer cake pans. Cover and allow to rise until doubled (about 30-45 minutes). Bake rolls in 375-degree F oven for 12-15 minutes or until tops are beginning to brown. Once baked and taken out of the oven, I brush tops lightly with melted butter. Rolls can also be made in greased muffin pan cups or in 9×12 baking pans instead of round cake pans. The rolls can also be placed on greased baking sheets where they can rise and cook without touching. I’ve shaped these into larger round rolls and placed them on greased baking sheets for larger bun-size rolls. I’ve also shaped the dough into long hoagie-style rolls where they baked on large cookie sheets or in glass Pyrex dishes. Use what you have and enjoy the home-baked whole wheat rolls. Just remember: cooking time will increase by a few minutes when baking larger rolls. *Wheat gluten flour. I use the wheat gluten flour to add elasticity to the dough. As an ingredient in this proportion, it help the rolls rise, but this ingredient can be omitted. Make these treats at home with wholesome ingredients! Make the Whole Wheat Roll recipe. Divide the risen dough in half. Roll each half into an 8 x 16 inch rectangle. Combine sugar, butter, and cinnamon. Spread half of the mixture onto each rectangle. Sprinkle each rectangle with raisins and pecans if you are using them. Roll the first dough-rectangle from the long side, as for a jelly roll; seal long edge. Repeat for the second dough-rectangle. Cut in 1-inch slices. Place in 2 greased 9-inch square baking pans. Cover and allow to rise until doubled (about 35 minutes). Oh, thank you for the recipes. Ok I do have the Victorio Hand Mill. It is a workout and a half. Grinds quite well if a little gritty first time through. You must also make sure it is clamped to a sturdy base when using or it just makes the grinding harder. It is what I have been using for now. Trying to decide if I should get an electric mill (anyone ever use a WonderMill?) or spend some and go for one of 3, Diamant (the caddy of mills from what I’m reading), a Grainmaker (love that it is USA made) or a Country Living (better price point & USA made). I’m looking for quality construction and excellent flour grinding. Can not wait to read everyone’s input. This is a great time for this article too since I just purchased a bunch of wheat berries. Thanks for the recipe Mrs. J. I made bread the other day that my husband actually thought was good. Always looking for fresh whole wheat flour recipes. Thank you to the others that provided me with helpful info on bread making the other day in the comments. It helped a lot. The Victorio has worked OK for us so far. The primary work surfaces are all metal, although I suspect over time they’ll wear down. It will convert for either hand grinding or electric with a detachable motor and it makes good flour. The main drawback I see is that the flour has a wide spray as it comes out–you need a high bowl. Also the clamp that holds it on to the table isn’t as dependable as I’d like. I haven’t used it as much as I should, when flour is so easy to come by. If it came down to grinding wheat without a mill I’d probably sprout it or make cereal rather than grinding by hand. We have a massive electric grinder in the basement from some time in the sixties, but it needs new stones. This is one of my favorite breads (it uses both whole wheat and all purpose flour). Whole wheat flour can usually be substituted for part or all of the all purpose flour in most recipes. So if a recipe calls for two cups flour, use one cup all purpose and one cup whole wheat. When using only whole wheat (and eliminating all purpose/white flour), use 7/8 cup whole wheat for one cup of white flour. The no-knead Herb Bread is delicious and I’ve been baking this bread for more than 20 years. Dissolve yeast in water. Combine yeast mixture, sugar, salt, 1 cup wheat flour, and 2 cups all-purpose flour in a large bowl. Mix for 2 minutes. Add egg, oil, herbs, and 1/2 cup flour; mix 2 additional minutes. Mix remaining flours together (1 cup of wheat and 2-3 cups of the all-purpose flour). Gradually stir into yeast-egg-herb batter. Dough-batter will be a moderately stiff bread batter. Divide dough in half; place each half in a greased bowl, turning dough to place greased side up. Cover and let rise in warm place (about 85-degrees), until double. Punch down and shape into 2 loaves. Place in greased 9 x 5 x 3 loaf pans. Cover and let rise until double in bulk. Bake at 375 degrees for 25-35 minutes. I have used a Diamant Mill for the past eight years and I don’t believe I or any of my children will wear it out in our lifetime, it is a very heavy mill. The mill is cast iron with a very heavy flywheel that helps keep the momentum going for hand milling. The feeding auger is designed to crack the grain before it gets to the burrs. The mill has regular, coarse and extra fine burrs available, we use the extra fine for wheat flour which does an excellent job, and the regular burrs for corn meal. We motorized ours with a 1 hp motor. It can be hand powered with a handle provided that attaches to the flywheel. 1/4 cup fresh ground flax seed. Mix everything well but the flour and flax first, then stir in the rest. Cook on griddle. Sweeten with favorite topping. Eat. I have also added additional grains for variety such as corn meal, barley and oatmeal. we do not mill the flax with the Diamant as it gums up the burrs and subsequently needs to be broken down to clean. I have looked into a second mill and it would be the GrainMaker as mentioned above, (two is one) I just have other preps that I don’t have that are needed first. I really like the bike powered option the GrainMaker provides; if you have ever hand milled any substantial amount of flour you know it’s a workout! we have both hand held and electric mills. My DH practically LIVES on the King Arthur website! LOL. I mean seriously, he spends alot of time chatting with others about how their recipes work at 9000 feet, as well as taking on-line baking classes from King Arthur. He makes fabulous breads….many artisan types, baguettes, frech and Italian loaves and flavored and sour dough as well. Constantly in the kitchen, gives most of it to my co-workers and clients! I use a Komo PK1 grain mill to stone grind my flour. The flour temperature is much cooler and yields a superior flour as compared to steel ground. Want more rise from that whole grain flour? For Ken’s 3 cup flour mix, take 1 and 1/2 cups of the flour, ALL of the water(75 degrees or so) and 80 % of the yeast and mix. Mix together everything else but the oil component and cover the previous with it. Let rise 2 hours. Mix everything in, including the oil. Let it rest for 20 minutes, then kneed. Let it rise, then fold, gluten cloak. and let it rise again. Bake. FYI – there is no need to proof instant yeast. I use bread machine yeast as it seams to yield more live yeast. If you use milk, it has to be scalded to eliminate the enzymes that break down gluten. After the kneading, put the dough in the refrigerator overnight. Yes, I do tend to go overboard on bread. I used the Victoro hand crank model for my wild seeds. I got it free from a special ordering $200 worth of food storage. Takes a lot of muscle endurance but well worth it in a grid down scenario, and I am only grinding for me and not a family. I used red raspberry seed and wild rice flour for pancakes and heavy sweet breads. Wild rice flour is gluten free and contains more protein and fiber than white or brown rice. So far it makes great pancakes and I buy bits and pieces at $3 a pound. A pound of wild rice flour at stores costs twice as much. Last time I checked Red Raspberry seed flour sells for over $40 a pound and is one of the most powerful antioxidants known and contains Ellagic Acid. I add a few teaspoons to my flour recipes to fight all those free radicals from the White House and MSM. free radicals…..you are killing me with laughter! I’ll bet also the free radicals from the chemtrails. Theres no telling what they are spraying on us. About 4 years ago we purchase a Magic Mill III, used but well maintained, but for the price of $75.00 I could not pass it up. Best investment we have made, it is old but does a great job on wheat berries, & rice. It has an adjustment for texture of the flour to be used. Draw back…it is loud!!!! I have no choice but use it outside when I need to grind our grains. Believe the neighbors think I am cutting up re-bar due to noise levels it produces. Lesson learned, never ever, think one can grind old shredded coconut in these machines. The coconut still retains way to much oil and you will be figuring out how to clean the grinder, along with the thought ‘am I going to be purchasing a new/used one’. Forgot to mention it is electric. I did find a mill made in Idaho call the “Sunshine”. It has been put through its paces at the local flour mill by the clientele and their children. Cost of the machine is $170.00 for a made in the USA mill. I have the $57 Victorio Hand Operated Grain Mill. My daughter did the most. Takes a while but works great. Attached strongly to our table. But I could see how investing in the more expensive one would help a great deal in easing the labor efforts. I bought Melissa the No.99 Grainmaker. The quality of the mill is remarkable. I have a few questions regarding baking bread. On average how long does it take to prepare and bake a loaf or loaves of bread? We currently do not stock the goods to make our own bread basically because we don’t make it and I worry about the ingredients going bad before we would have to use them if TSHTF. How long do the goods store before going bad? I remember my mom making our own bread when I was younger and it seemed like it was quite a time consuming process. I know its healthier to make your own but I wonder about the time. Also does anyone use those bread baking machines (not oven) and how do those work for you? Does it save time? This maybe something for us to look into to save money and eat healthier but the time is what I wonder about. Since there is only so much of it in a day. I make no-knead bread and throw it in the bread maker on bake only. When summer comes I’m going to try using my solar oven for that. We’ll see. Invest that money in a Bosch Universal Mixer. No, a stand mixer will not hold up. I can mix and knead a loaf of bread with it in 12 minutes. Setting 1 to mix for about 2 minutes and setting 2 for 5 minutes to knead. Using bread machine yeast and a 75 degree kitchen it will take 1 hour to rise. Look for the dough to be about 1″ over the top of the pan. A 3 cup of whole wheat flour loaf in a 8 x 4 pan will take 30 minutes in a 350 degree oven. Using a digital thermometer – read 190 degrees in the center of the loaf. This is a real basic one, so get started and move on from there. You can mix by hand with a wooden spoon and knead for 10 minutes. No More Bricks is a book that is a good place to start. Thanks everyone for the info. I think I will talk with my wife and see if she would be on board with us making our own bread. This is why I live this site. Everyone is so helpful. Supposed to be ” This is why I love this site”. Dam autocorrect. I often use the bread machines. Fast and easy, I can make bread for dinner with less than five minutes work. Another technique is to use the bread machines but after the first rise put the dough into a bread pan and cook it in the oven. I usually make simple bread or french bread. Nothing to spoil. I keep the yeast in the freezer and it lasts for years. I have flower that is older than my youngest grand daughter (6 years old) and it is fine, no off smell or taste. I generally don’t use any oil/fat so I don’t have to worry about that going rancid. I often add half a cup of oatmeal for texture and taste but even that is older than my next youngest grand daughter (8). So in general I don’t think keeping the makings around for awhile will hurt anything. Hey 11HE9, start to finish most breads average about 3 hours. As far as ingredients, hard red wheat berries will last a very, very long time. Also salt, sugar will last forever. Yeast if stored properly can last allot longer than the expiration date. I keep mine in an airtight container in the freezer, and the batch I am working on is about 11 years old now. I have to use a little more than the recipe calls for as not all the yeast is viable now. There is nothing like home made bread. When the kids were still around, I had to make 2 loaves at a time as they would always wipe out the first loaf the minute it was done cooking. If you’re making (and eating) your own bread, you’ll rotate through the ingredients just like anything else. It’s good to know that yeast will keep a long time in the freezer! That is where I keep mine but I always figured that was the weak link in bread ingredients. Use yeast at long as it’s available, but look up how to make a yeast culture as well. When SHTF hits, and yeast is no longer available and your freezer isn’t functioning you can still have raised bread. Note that this is very flour intensive–there’s a reason they called sourdough “friendship bread.” Once you get a culture started it has to be fed every week or so, which after a while is a LOT of dough. Thats right, all from one simple recipe. My first grinder was a Lehmans own, its decent, was cheap, gets the job done, but isnt the best. One thing i have noticed, weve gotten lazy, modern convenience has made us soft! My favorite no-knead bread is 3 c flour, 1 1/2 c water, 1 T yeast. Maybe a little salt. I like it because I can remember the proportions without referring to a recipe. 🙂 If I’m doing it overnight (so it sits for 18 to 24 hours to develop the yeast) I just use a pinch of yeast. Maybe 1/4 teaspoon, if that. That’s like this one, I don’t even think about it anymore,, so simple, I add stuff lots of times, like for sandwich bread I add a couple cups of quick oats and a cup or so of honey, and some eggs, or a brioche and add a bunch of eggs and butter and sugar and cut some water… its really not an exact science, double grinding and screening yields different results too. I ordered a 100# of wheat berries from Bob’s Red Mill, have used their flour for years. I still don’t have a hand mill, although I am fine with my electric grinder. I need a hand mill but something easier priced. No wonder folks used to travel a day to the grain mills! Hey huck! When you do get the hand mill, which one do you want? That pricey Grain Master 99 of course! Not happening on my budget. I saw elsewhere that the Corona works well. I dropped it in Amazon wish list until I am ready and get more info. We have an older 3/4 hp. wood framed mill grinder. Also a newer magic Mill and I bought 6 US made hand cranks from a hardware store that was closing. (NOBODY WANTED THEM SO I FIGURED I WOULD GIVE THOSE POOR ORPHANS A HOME!LOL). I have seen online where people have made attachments to hook up their hand grinders to a stationary exercise bike(Mother Earth News)Leg power a lot better than hand power.Also making a socket attachment to use a battery drill to run a hand grinder.The beer making sites also have guys who have made their own grinders out of everyday stuff. One thing I noticed thru the comments which is true is it does take time to grind grain. Folks who haven’t done it should so they can gauge how much time to set aside to make flour. Have had a Country Living Mill as shown in the article, plus two complete sets of spare parts. Remember to get spare parts for whatever Mill you own. I also bought a used exercise treadmill off of Craigslist 5-6 years ago for $50, removed the motor and control board, and mounted it under the Country Living Mill in a plywood box. Now powered, the Mill only takes 5-10 minutes max to mill a couple of cups of grain. (Not precisely sure how long though, I walk away to prepare the rest of the ingredients). Two benefits of a powered Mill are, obviously, the increased speed, but also nobody has to waste time hand-turning the wheel. Of course hand grinding may be a necessity in the future, but it’s easy enough to remount the handle on the large pulley. I started with the Wondermill jr. and used it exclusively for a year and a half before my spouse gifted me with an electric Nutrimill and the Bosch mixer. The hand cranked mill has stone and metal burrs which allow different types of milling and I was pleased with the final product. But it was a lot of work to crack corn for cornmeal! The workout needed for two loaves of bread was worse in the hot months. I absolutely love the Bosch, best investment ever! And I have been very happy with the Nutrimill as the consistency of the grain is what I wanted, you just need to learn what settings you want for the flour you are attempting to grind. I really like the Golden 86 hard white wheat for my regular sandwich bread, but every so often I grind a little hard red to change the flavor a bit. I am still learning how to make a good pumpernickel and almost there. I actually gave my regular bread recipe the other day when someone requested, but will put it here also since we are on this topic today. I was so pleased to see all the other receipts here today and cannot wait to try some of them! ▪ 1/4 cup liquid honey plus 1 teaspoon honey. Water should just mix into flour without any excess; flour/water mixture should not be watery. Make sure there is no dry flour. ▪ Mix 2 1/4 teaspoons yeast into a one cup container that holds ¼ cup of warm water and 1 teaspoon honey until just mixed. Set aside and let rise for half hour. Do not over-mix. Sponge should be visibly active: bubbles forming before adding to recipe. 3. Melt 3 tbsp. butter and add ¼ cup honey; cool to room temperature. 1. After flour has soaked (step 1) and sponge is bubbly (step 2) mix well together with a plastic spatula. Then add: melted butter and honey at room temperature and 1 tsp. salt (sprinkled in). Stir well. 2. I then place this mixture into my Bosch mixer and then slowly add in the remaining 3 cups flour to right consistency. It takes a couple minutes to get it to start holding together. If too wet, add a bit more whole wheat (which is thirsty flour) and then knead for 8 minutes. If it is too dry, then just a drop of water at a time (I have not had this issue yet, but it is possible). 3. Place dough in large greased bowl. Cover with a damp tea towel. Place in warm (not hot!) corner on counter top. Allow to rise until double. I usually give it about 2 hours. Test by sticking your wet finger in dough and if it does not fill in it is ready. 4. Grease up your bread working area with a dab of olive oil, spread with your hand. Remove your dough from bowl with wet side up and smoosh down flat or use rolling pin to flatten out. Divide into 2 even sizes. Roll with a rolling pin and then roll up dough or flatten with hand and so the same thing. Pinch to make a loaf shape. Place in greased loaf pan (I use lard with wax paper to grease my cast iron pans). Cover loaves with damp tea towel. 5. Allow to rise until double about 1 hour. Allow to rise to about 1 inch about pan side because it will continue rising in the oven. Start oven after 30 minutes rising so temp is correct when inserted in oven. 6. Bake at 425F for 23-24 minutes or until loaves are lightly browned and smell amazing. 7. Remove from oven and cool 2 minutes on wire rack. Remove from loaf pans and cool completely on wire rack. Brush tops with butter if desired to make the loaf tops soft. Bread will only keep a few days because there are no preservatives. This is an awesome bread, but when you first start baking it, consider using 4 cups whole wheat and two regular flour until your body gets used the whole wheat and you get used to baking with 100 percent whole wheat. I do this when the grandchildren come to visit. Also, you may need to increase the yeast a bit when using entirely whole wheat depending upon your yeast.